Mexico's independence from Spain is celebrated every year in September. From the beginning of the month, Mexico's streets and buildings are festooned with an explosion of green, white, and red, but the main events occur on the evening of September 15 when crowds gather in town squares across the nation to shout "Viva México!" and on September 16 when you'll find parades and other civic celebrations. Mexican patriotic spirit is embodied in a multitude of popular traditions. 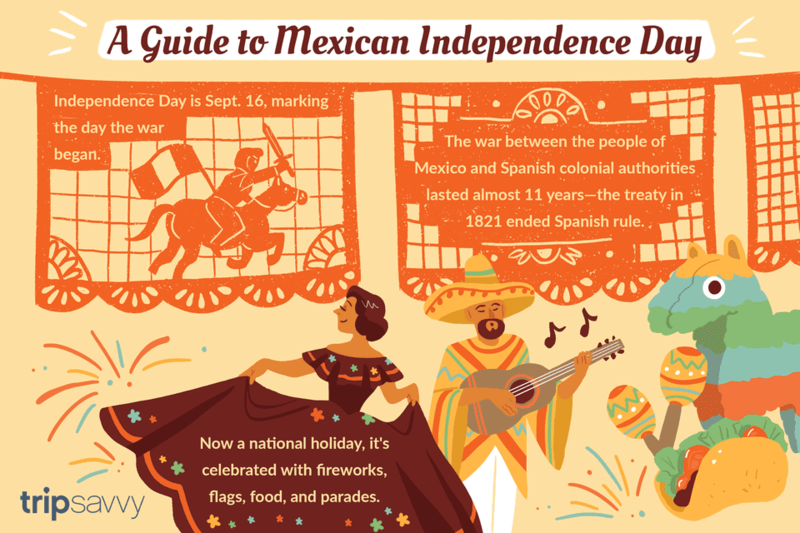 Find out more about Mexican Independence Day—an important national holiday for the country. This holiday is also referred to in Mexico by the date of the event: el dieciséis de Septiembre (the 16th of September). It is one of Las Fiestas Patrias (the patriotic festivals) and is celebrated on the night of September 15 and all day on September 16. This is one of the most important fiestas of the year in Mexico, and the whole month of September is referred to as el mes de la patria (month of the homeland). Some people outside of Mexico may confuse Mexican Independence Day with Cinco de Mayo (5th of May), but that is a different celebration (and a much less important one in Mexico). Mexico's War of Independence officially began in the early hours of September 16, 1810, when the priest Miguel Hidalgo y Costilla rang the church bell and cried out to the townspeople to take up arms and rise up against the Spanish Crown, an event that is known as ​el grito de Dolores (the cry of Dolores), named after the town in Guanajuato state where it took place. Within no time the priest had assembled a large and unruly but resolute mob to march with him toward ​Mexico City, sparking the uprising against Spanish rule. Learn more about the history of the Cry of Dolores and where to celebrate El Grito. The Mexican War of Independence was an armed conflict between the people of Mexico and Spanish colonial authorities. The movement was initiated by criollos (Mexican-born people of Spanish descent), with mestizos (people of mixed indigenous and European heritage) and native people joining in the struggle, though each of these groups had different motives and goals. The war lasted more than a decade and ended with the signing of the Treaty of Córdoba on August 24, 1821, ending three centuries of Spanish rule. Mexico's flag, the coat of arms, and the national anthem are Mexico's national symbols (los símbolos patrios), and they feature prominently in Independence Day celebrations and decorations. Mexican Independence Day is celebrated with fireworks, flags, food, and parades. On the night of September 15, the cry of Dolores is re-enacted by local politicians in the public squares of most cities and towns throughout the country. On September 16, there are parades and civic ceremonies commemorating Mexico's independence. September 16 is a national holiday in Mexico, so all schools, banks, and government offices are closed. For some fun ideas on how to honor Mexico's independence, check out ​Ways to Celebrate Mexican Independence Day. Chiles en Nogada is a Mexican dish that has the colors of the Mexican flag, and it's a favorite food for this holiday. Pozole, a soup made of hominy and pork, is also a popular food for Independence Day celebrations. As for drinks, tequila and mezcal fit the bill. For a really festive touch, try a Mexican flag shooter. To learn about more popular foods that are perfect for celebrating Mexico, see ​Festive Mexican Dishes. How Do You Celebrate Mexican Independence Day?